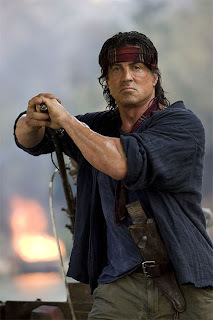 I first saw him when I was in class 2.When my uncle brought home a VHS cassette of Rambo-First blood, I never had any clue who the actor was.When the movie was over, I was out in my backyard with my very own bow and arrow. I bent a stick and tied a twine to its ends and there i had, my very first bow. The days that followed that movie session were bad for my folks at home. Arrows (twigs) were seen flying around the house.Books were replaced by rubber bands and twigs in my school bag.I hated wearing my school uniform. But I had no other go. I used to wait for weekends so that I could go barebodied, just like my childhood hero. My mother would so often be screaming from the kitchen, because the dirty cloth that is used to wipe the wet utensils would be tied around my head.I stopped playing with Bow and arrow,when one of my attacks on my imaginary enemies ended up in the eyes of my neighbour uncle. 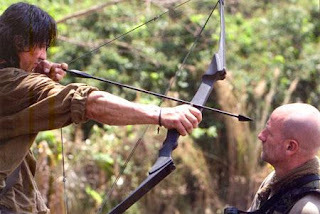 That was the last time I played with Bow and arrow. When I was in class 4,my cousins enlightened me by letting me know that Stallone has come up with two more sequels of Rambo. 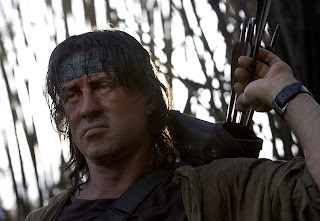 I was finally lucky to see Rambo part 2 and 3 in the year 1991. After watching the movie, my interests took a wild turn and now I wanted a gun.Leo toys provided me instant relief and I had my first plastic gun with 4 plastic pellets. My sister used to be at the receiving end on most occasions.But one day when she found out that my aim was getting better and better by the day, she did the unthinkable. She melted my plastic gun with fire. 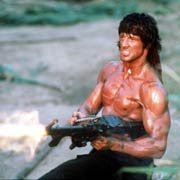 Days went by and Rambo never came up with any more sequences. I finished my schooling with a heavy heart Six years of college life and three years into work life, he surprised me with Rambo 4. Stallone is sixty plus now.I saw the movie and I just loved it. He still has a lot of ammunition left with him. Rambo! you do sure rock. this time you can go for Bomb or some blasting material. You will surely go for your this thing. your office would be the best target!! mebbe cos of all the massive drugs he takes? LOL!